This entry was posted in Original Western Art and tagged acrylic painting, landscape, nature, original art, west. Bookmark the permalink. Very cool, love the tatonkas! 🙂 A really interesting take on bullies! But I think this little prairie dog will probably fair ok. Love your textures and color palette! Very happy to see you back, I hope this means you are feeling better. The picture is outstanding. is that little prarie dog a bully???? Laughing. I am reading a very interesting, albeit exhaustive book titled”The Heart of Everything That Is: The Untold Story of Red Cloud….” It is about the Sioux nation and you might find it very interesting. Thanks, Cindy – I’ll have to look for that book, because it sounds very interesting. Well, thank you. I suspect that prairie dog has survived worse… :). YOU’RE POSTING!!! HUGE SMILES AND HUGS. Thanks… and right back at you. For me, looking at a bison is like looking a bit into the past… Beautiful painting Trapper! Thank you, your comment perfectly express how I feel! Looks just like a field around the corner from the Crazyhorse Monument! 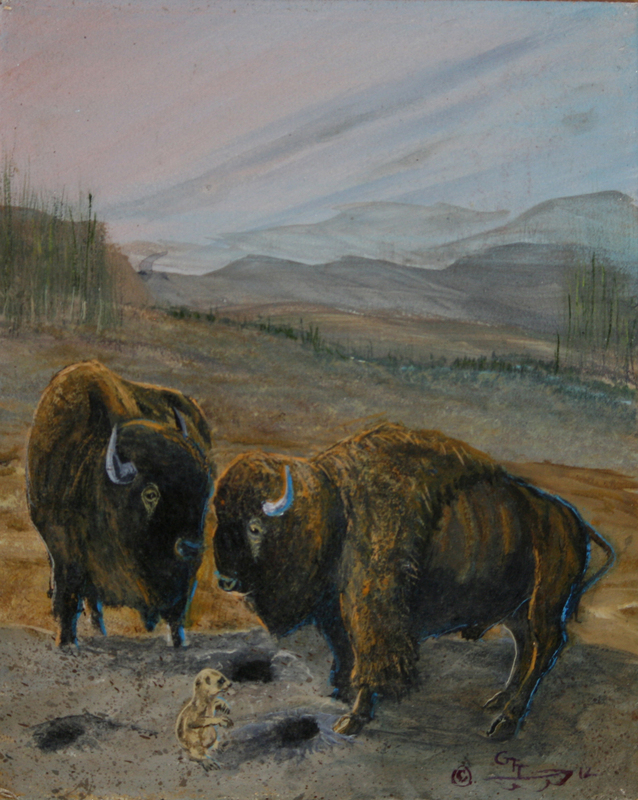 There were plenty of bison and prairie dogs happening in it as I rode by…very realistic portrayal! Thanks for stopping by, Morguie and taking the time to comment. I appreciate it. You and me both… utterly majestic and a little bit terrifying, I believe. Thanks for stopping by. Yes, very true and well stated; majestic as well as terrifying. Hope your health is continuing to be well. Any pictures coming soon?